This guest article by multimillionaire nonprofit benefactor Paul J. Meyer describes the qualities possessed by successful fundraisers and contrasts those with the qualities exhibited by the unsuccessful fundraisers. Paul is not just describing his own experience as a nonprofit donor. He took the time to personally interview 30 other major donors to find the common qualities possessed by a successful major gift fundraiser. In order to get their valuable perspectives on fundraising, I interviewed more than 30 donors of the highest caliber who have given millions and millions of dollars to various charities, ministries, and organizations. 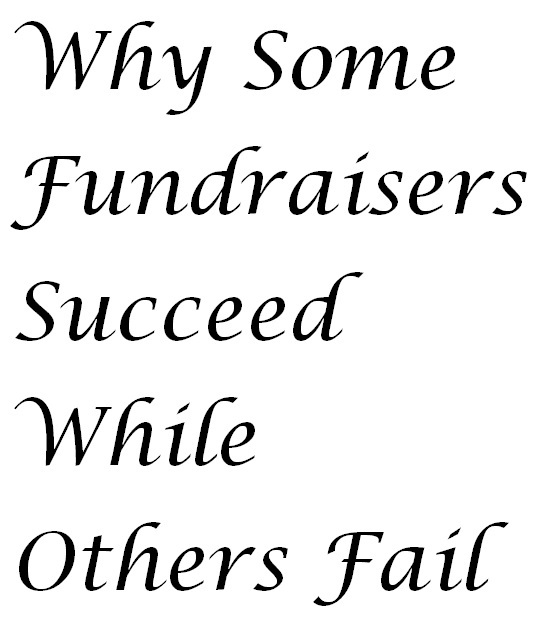 I asked them why some fundraisers succeed while others fail. Sincere relationship — Above all, successful fundraisers are sincere. Personal integrity — Successful fundraisers are upfront, genuine, and always operate with integrity. Knowledge of their charity — Successful fundraisers are well informed. Clearly defined goals — Successful fundraisers clearly state the mission, needs, and opportunity a donor has to help accomplish the mission. Regular communication — Successful fundraisers keep donors in the loop. Assurance of cost effectiveness — Successful fundraisers show donors that their money is doing what was promised. Credibility — Successful fundraisers use donors’ funds for the intended purpose only. Matching gifts — Successful fundraisers think about lead gifts or matching gifts so donors’ gifts are multiplied. Deserving cause — Successful fundraisers help donors feel that they are making a worthwhile contribution to a worthwhile cause. Shared vision — Successful fundraisers seek donors who share the organization’s vision and want to make a difference. Passion — Successful fundraisers believe in their cause so much that they contribute to it themselves. Common interest — Successful fundraisers find donors who are interested in their mission. Enthusiasm — Successful fundraisers are enthusiastic about their cause. Quality presentation — Successful fundraisers present the charity in an enticing, concise, and articulate manner. Gratitude — Successful fundraisers must have an air of gratitude, no matter the amount of the gift. Persistence — Successful fundraisers are persistent without being offensive. Lack of personal relationship — One of the most common reasons that fundraisers fail is that they haven’t established a relationship with the donor. Negative characteristics portrayed — If something is said or done that runs up the “red flag” for the donor, the fundraiser will most likely fail. Lack of sincerity and belief — Failure comes when fundraisers are not sincere and do not have a strong belief in their charity. Poor communication — Failure is imminent for fundraisers who do not communicate, including communicating about the charity and keeping in touch with the donor. Lack of clear goals — Fundraising without clear goals leads to lack of balance and action. Lack of integrity — Any hint of a fundraiser’s lack of integrity, and the donor will slow down, back up, or demand answers. Perceived ungratefulness — Fundraisers who fail rarely give donors a personal thank-you for their gift or else they use it as a steppingstone to the next request. Desperation letters — Desperation letters are not effective, well received, or quickly forgotten. Pressure selling — High-pressure salesmanship is a serious turnoff. Lack of knowledge — Fundraisers fail because they cannot answer the questions that donors ask. Inaction — Many fundraisers fail because they are not getting the message out to enough people. Wastefulness — Fundraisers fail when they do not spend the donors’ money wisely. Lack of interest — Fundraisers who fail seldom do the homework necessary to know if the prospective donor is even interested in the charity. Inappropriate appreciation — Unsuccessful fundraisers don’t take the time or care to find out how their donors expect to be appreciated. Forgetting the obvious — If a fundraiser does not leave a donor with all the necessary contact information, the donor cannot give. Wasting time — Prospective donors do not appreciate when fundraisers are insensitive to their time and schedule. Having a donor’s perspective can help make the difference between success and failure as a fundraiser!